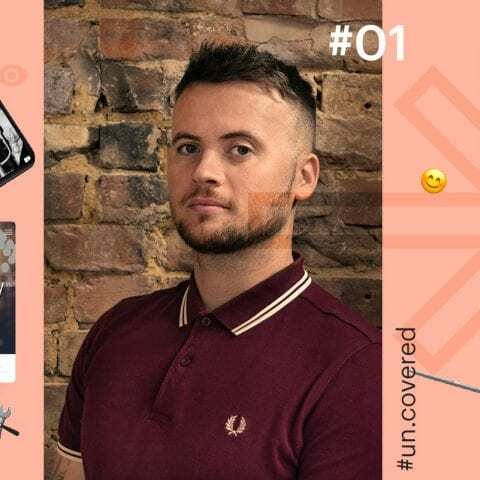 In the first of a series of articles helping you get to know the Un.titled team, our lead Digital Designer Darren Barrett discusses his background, his passions and what he loves about Un.titled’s creative digital agency. Read on to discover more about Darren's story and experience with Un.titled. Tell us about where you’re from and how long you’ve been with Un.titled. I’m born and bred in Leicester, just on the outskirts of the city in a place called Aylestone Village. I’ve been part of the Un.titled team for just under a year but I’ve been a huge fan of their work for as long as I can remember. How did you get into digital design? Back in the early 2000s, digital design wasn’t covered in great detail on my university course. But I was fortunate enough to secure employment immediately after I graduated. I joined a small company called Baseline in Derby, and it was here where I was fully exposed to digital design. This company had big ambitions and was run by one man – Craig Barker. Craig taught me how to think digitally. He taught me how to compose a design which contained all the right elements to work effectively online. He was very particular in his processes and his attention to detail – something which I carry with me to this very day. What do you believe is key to strong digital design? A magician never reveals his secrets – but lucky for you I wouldn’t class myself as a magician! I believe in sharing processes and ideas. How else are we supposed to better ourselves? Strong digital design needs to be true to the brand and a solid digital reflection. The experiences between media should be of a fluid nature and getting this right can sometimes be tricky. What I have discovered along the way is that digital design should be a harmonious mix of strong typography and great imagery. This should be blended with engaging, beautiful and useable layouts. I believe this combination is behind great web design. Every design should be scalable to any device and accessible to all, but it also helps when there’s an element of surprise added in. The smallest detail can make a big difference and set you apart from the competition. What have been your favourite projects to work on at Un.titled? Un.titled is part of the Williams Commerce group, and we were tasked with redesigning the Williams Commerce website. This was a huge task but one that came with a lot of rewards. The site was designed to bring the company forward and I’m delighted to see it going from strength to strength, with the company heading in the right direction. We also worked with Film Hub Midlands, and this was probably the most insightful project I’ve been a part of. The exposure to our usability workshops from the beginning was a huge advantage for me. Understanding what our client’s customers need from a website really gets you thinking. Collaborating with the developers during the design and build phase is just as fun. This is my playground where I can really let loose with ideas. Our favourite parts of this design was the 404 and the no search results page, which used clips from iconic films that were both relevant and comical. The new Un.titled site is also well underway and will be ready to launch in the coming weeks. We’ve had a lot of fun creating this one and it’s going to be something really special when we let it run free! I’ve also been working on our brand bible as part of our brand repositioning. Additionally, after recently joining forces with Tincan and having a marketing team at our disposal, we need to make sure we are all singing from the same hymn sheet. What measures do you take to ensure a successful design? I am a firm believer in designing with empathy and I don’t just mean in terms of site usability. This covers everybody involved – from the client to the project manager to the developer through to the marketing team. If I’m not mindful about every pillar in the process, the whole design can snowball into something ugly. I always design with the developer in mind, and look to ask the right questions at the right time during the design process. I also ensure the files I hand over are formatted suitably enough to work on. You can’t design something which is out of scope for the developer. It’s about making their life as easy as possible, but also throwing in a few curveballs along the way. You’ve got to keep developers on their toes otherwise they’ll get bored! I also look to ensure the marketing team has everything they need to build on a new site – what images to use, the brand colours, and how to utilise client logos for example. All of this helps the process and ensures consistency. When it comes to the client themselves, it’s all about managing their expectations. These need to be met, so it’s important to make sure everything is within scope before you show your work to them. Additionally, having clear communication with the project manager is vital. Much like the client, their expectations must be met. They need to ensure what they are relaying makes sense to them as much as it does to the client. What do you like about working with Un.titled? I love the creative vibe this agency oozes, the clients they have and the people that are working here. Un.titled is a long standing contributor to the city’s creative community and we’re about to embark on a new era for this agency, which I’m ecstatic to be a part of. I’ve always admired the work of Un.titled and to say I work here is a dream come true! What are your hobbies away from work? In recent years I’ve turned my hand to cooking. I’m still learning the ropes and my wife is way ahead of me, but I’m getting there. We both like trying new food and sampling the different food festivals on offer. We’re slowly becoming regulars at Digbeth Dining Club over in Birmingham. I also attempt DIY when I can. I’m not the best at it but we all love a trier, right? I find it quite satisfying when a project comes together and you can stand back and admire it…even if the wallpaper’s uneven. What’s your favourite place to eat in Leicester? I’m a big fan of street food and I have been for a number of years. If it was something quick for lunch I might run over to Fresh Naan on Leicester’s Lee Circle – that’s a real hidden gem! I also love what the LCB Depot on Rutland Street does on the last Friday of every month, where they have an eclectic mix of street food vendors, music and art. It has something for everyone. If I was going out for a real treat or celebrating an anniversary, I’d go to a place called Haycock & Tailbar on Belvoir Street. Disguised as a 1920’s speakeasy, this place offers up a variety of food and create a real theatrical experience. We hope you enjoyed the first part of our Un.covered series. Stay tuned for the next one and meanwhile follow us on Instagram to see what the Un.titled team’s been up to recently.